Thank you checking up on me with my long, unintentional absence here. Whenever Ryan mentions he misses reading my blog thoughts, I know it's long overdue for a post. We have a backyard hotdog/s'mores roast on the first Monday of each month. It began when we moved into Magnolia Manor and had a backyard large enough to actually enjoy. We use it as an "excuse" to invite others over because it's such an easy dinner...plus I don't have to clean my house to enjoy it. I suppose you could say it's one of our new traditions, and traditions, as Ryan recently reminded me, are what the kids will remember. One particular evening we had grapefruit juice to counteract, or at least help balance the negative effects of our hotdogs (all natural!). Clover drank one up, ripped the tab off, and crushed it. 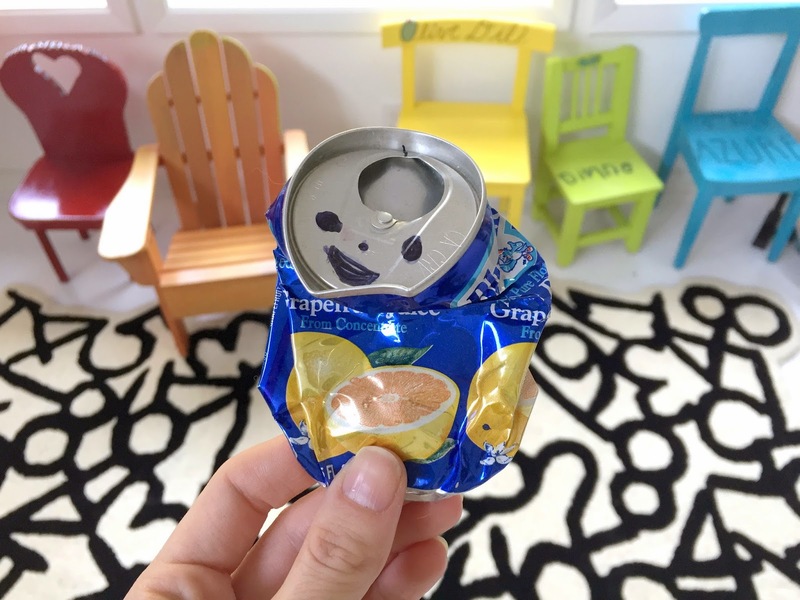 Now perhaps she was overly tired, or it was just one of those days, which even 6 year-olds have, but after seeing her cute little can crushed, she was immediately regretful. She began to cry big, body-heaving sobs of sadness that she had crumpled her can. I told her we could recycle it and that she would become new, bright and shiny. This only increased the volume of the drama. The rest of us, in hushed tones, wondered aloud why she was emotionally attached to her piece of tin, and stifled giggles that accompanied the amusement of the whole situation. As I shooed her off to get showered and in bed, the can went with her. She clutched it with her might, convinced that her gentle caressing would undo her actions. She only let it out of her hands as Olive kindly offered to draw a face on it, personifying the recyclable even more. As she was getting in bed, she told me she was going to sleep with it. My first reaction was to laugh and lay down the law of being the parent, you are not going to sleep with a sticky, crumpled can. But, in that moment we're often given as parents to change our gut reaction to what should be the rightful action, I agreed, because it all comes down to math. To me, this was nothing more than Monday night hysterics of a 6 year-old, to be forgotten with the morning rush of school lunches and car line. To Clover, it was much more than that. While my worries and joys might seem bigger to me than hers are to her, I realized that they are the same ratio. Her worries of homework and friends being mean versus the joys of having a playdate or being invited to a birthday party are very much the same ratio as mine, thus they are very much equal. I was grateful that my mind worked faster than my mouth in this moment, that little grace to say the right thing. I found this under the bathroom vanity yesterday and vowed to remember that her ratio is just as important as mine. As is everyone's. This is a beautiful illustration of an idea I've been struggling to articulate for years, ever since I was a kid myself. Thank you for the simple, compelling reminder! Oh wow, thanks a million for this entry. I've forgotten this too many times, hopefully I'll remember in the future. Beautiful insight. Thanks for sharing. Miss you! It's good to remember how important these thing are to them. Good reminder. I'm SOOOOO glad Ryan missed your blog - because I sure have!!! Glad you're back and hope you enjoyed your hiatus! Traditions are very special - and apparently so are cans! Hoping Clover realizes what an awesome mom she has!!! This post caught me at the right time! Thank you for the reminder.